I don’t usually do housey type posts but I figured what the hey! Anyways the picture I can’t find was of the “rubbish” that’s leftover after preparing dinner, you know onion skins, the core from peppers etc. I *hate* throwing it in the rubbish. And last month our local council (rightly) moved our town onto fortnightly bin collections. So we now have the general waste (black bin) collected one week and the recycling (blue bin) the next week. With weekly collections we rarely half filled the black bin and although the recycling was always fortnightly it would be the one that we always had to squish down. So with the news of both bins being fortnightly we got one of *these* to try and calm my dislike of putting food scraps in the general rubbish. As of yet we haven’t used it and it’s sat looking forlornly at me. We need to deconstruct the shed (which is falling apart and taking up a hunk of our little garden!) And then the compost bin will have a ‘proper’ home. With the boys to look after and a british summer that seems to have gone AWOL it’s proving more of a task than I expected to get started on the shed. Also once it’s in place I have no idea what I absolutely need to get it started, so I thought I’d ask the blogesphere! Do you home compost? Do you have any hints or tips to get started? I’ve googled but it returns so many results I still don’t really know where to start! Also yesterday I made a risotto (this one) and before I start I get everything out etc. 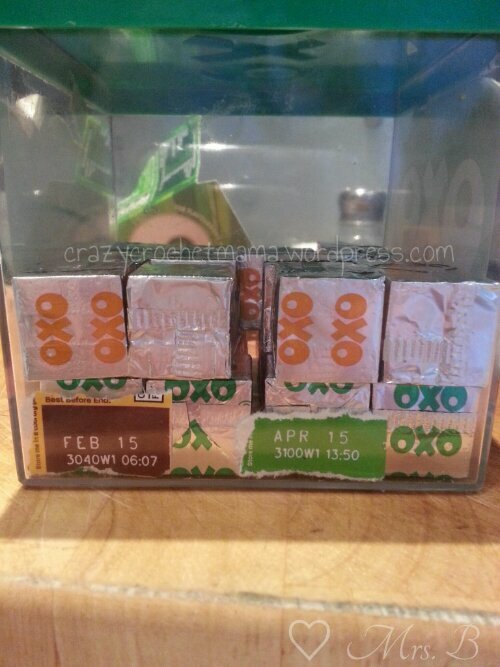 But I had to replenish my oxo tub and wondered if anyone else does this…. Boring to some, but to me it’s really useful! I’d put off trying stylecraft because I figured “it’s only acrylic yarn it’ll be the same as any other acrylic” but it’s so soft! Even before I’ve done my usual soak once I’ve made things! I brought it from The Wool Loft they also have a facebook page *here*. Their customer service was brilliant (I couldn’t find a yarn I wanted on their site that they’d posted on facebook so I sent them a message and they sorted it for me) and reaply friendly! 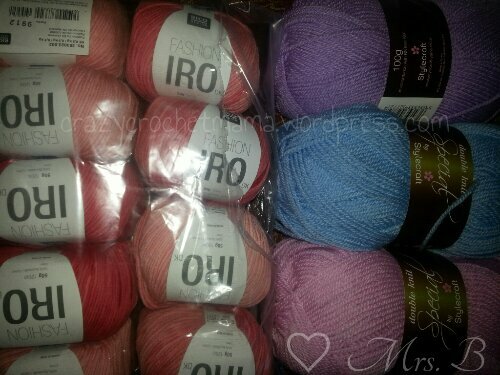 I also got some rico yarn for a blanket for one of my ‘real life’ friends who’s brother is having a baby from them. Who doesn’t love getting yarny post?! So, really this should be a tah-dah post for the primary colours blanket but I still haven’t turned on the laptop and transferred pictures from the camera! It will happen soon! Instead I thought I’d share something spirally with you! I can’t remember where I saw this first if it was on ravelry whilst looking for new gramny square patterns or whilst noseying through blogs but as soon as I saw it I knew I had to make one. 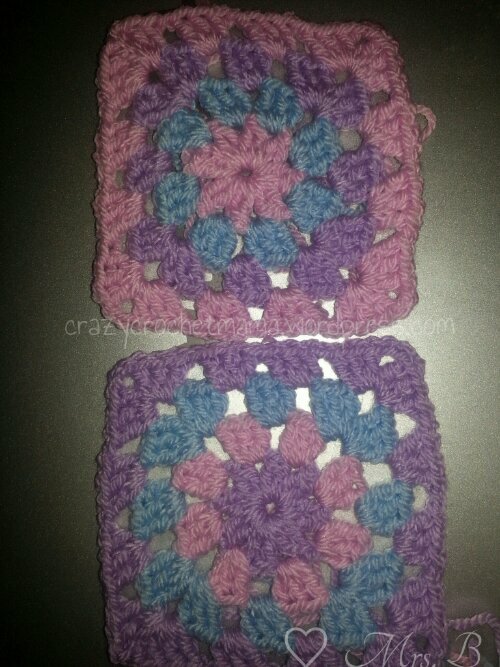 Luckily someone on my list of people who want a blanket also had the same need so I’m making one! 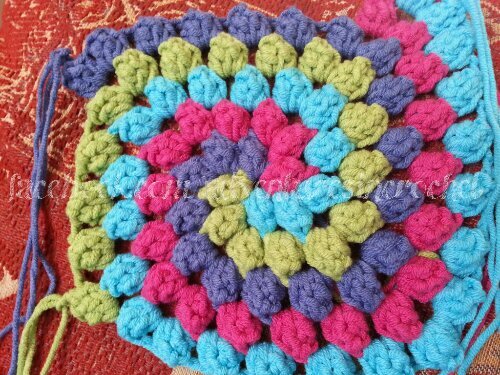 The pattern is from http://colourinasimplelife.blogspot.com and is called the granny bobble spiral. It’s beautiful and really easy to follow the instructions. I love the colours as soon as I saw them I knew it had to be that exact yarn. Its by Katia and is called Alabama. 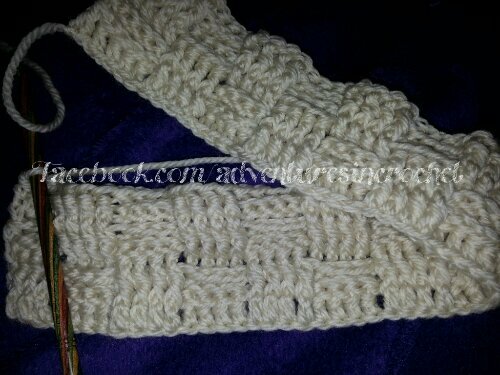 I’ve never used Katia yarn before but I think I will be in future! 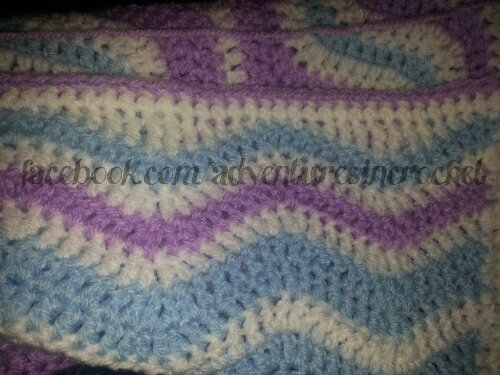 I’ve also finished up the attic24 ripple I was working on and managed to do a straight border on it which I am still chuffed I managed to do. I was sure Lucy had posted how to straighten off the top and bottom but couldn’t find it so I kind of winged it and it worked! And a lady who has a shop on Facebook (MrsJosieK) asked me to make some cushion covers and we saw one made by Keep Calm and Crochet On UK and knew it had to be basketweave for hers too, which I’d never done before because I couldn’t work out how it looks like that (I’d never looked at a pattern for it) but once i got going it clicked! Unfortunately I totally underestimated how much yarn I would need so have to get more. Its Rico big wool (I think that’s what it was called!) Its merino and lovely to work with! I best go and do some mummy type stuff. I’m so glad I can blog from my new phone that makes it easier! Hope you are all ok and if you’re on fb check out my page as I post pics on there pretty regularly x.